Sun in Libra’s social butterfly routine will make Moon in Cancer feel very insecure. However, Libra loves to please, and Cancer needs to be needed. Despite their differences, these two can bond, or become enmeshed in a co-dependent relationship. 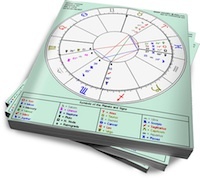 Sun in Libra is the expert socializer. He knows the steps to the dance because he is highly attuned to how others respond. He doesn’t just enjoy being social, he craves it. His purpose is to be involved in harmonious exchanges with a variety of people. He’s also a people pleaser, so a partner who honors Sun in Libra’s desires is essential. He may pretend that he’s OK with everything, but this Venus-ruled sign is sensitive about being unappreciated. Moon in Cancer needs to mother someone (usually her partner). She feels most secure when she’s making her lover feel good, and this will usually involve food, hugs and a cozy domestic environment. Moon in Cancer also needs to be cared for, although this may become distorted when she’s feeling insecure. Her Shadow emerges as the (s)mothering partner who keeps her lover dependent on her care, by alternating moody withdrawal with an overabundance of concern. Sun in Libra will enjoy Cancer’s warm support and her continuous validation. Moon in Cancer will feel secure as Libra constantly checks in to ensure she’s happy. However, tension will emerge when Cancer feels threatened by Libra’s social connections. He’ll rush to assure her that she’s the only one for him, while feeling resentful that he has to do this. At the same time, Libra will not be able to tolerate Cancer’s moody sulks, and will do everything in his power to restore harmony. In order to prevent this relationship from spiraling into an anxious, needy mess, both partners will need to detach a little from the other. Sun in Libra will have to realize that he can’t always keep Cancer happy, and Moon in Cancer will need to loosen her loving grip by giving her partner breathing room.